For October, the average contiguous U.S. temperature was 53.8°F, 0.3°F below the 20th century average. This ranked near the middle value in the 124-year period of record and was the coolest October since 2013. 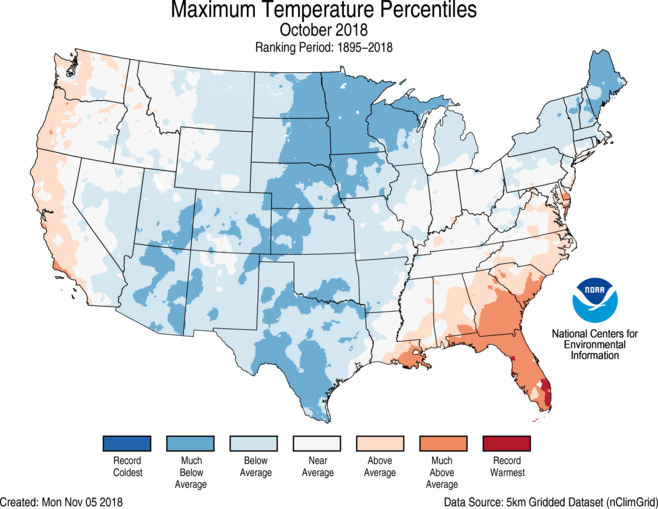 Below-average temperatures, particularly daytime temperatures, were observed across most interior locations of the nation and parts of the Northeast. Above-average temperatures were observed along the West Coast and from the Southeast to Mid-Atlantic. Parts of southern Florida were record warm. 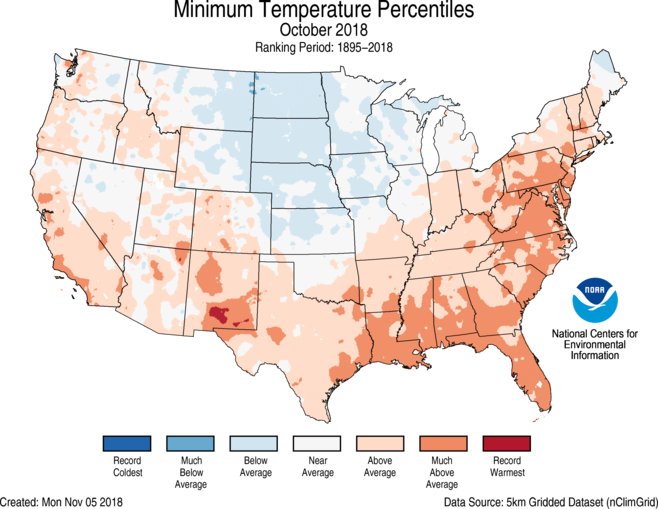 For the year-to-date, the contiguous U.S. average temperature was 56.7°F, 1.7°F above average, and ranked as the 10th warmest on record. The October precipitation total for the contiguous U.S. was 3.37 inches, 1.21 inch above average, and marked the sixth wettest on record. Above-average precipitation fell across large parts of the U.S., with much-above-average precipitation across the Southwest, Great Plains and Midwest. For the second consecutive month, Texas was record wet. Below-average precipitation fell across parts of the West, Ohio Valley and Southeast. For the year-to-date, the contiguous U.S. precipitation total was 28.63 inches, 3.27 inches above average, and was the fifth wettest January-October on record. 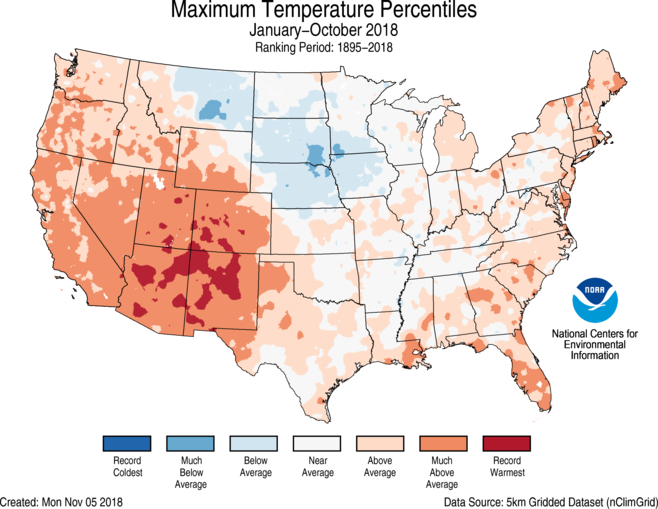 Below-average October temperatures were observed across the Intermountain West, Great Plains and northern New England, while above-average temperatures were confined to the West Coast and Southeast to Mid-Atlantic. During October, there was a stark contrast between daytime high temperatures, which were cooler than average, and nighttime low temperatures, which were warmer than average particularly across the central U.S. Much-below-average daytime temperatures stretched from the Southwest, through the Great Plains, and into the Upper Midwest and Northeast. Meanwhile, above-average nighttime temperatures were observed across the West, South and much of the East. However, the Central and Northern Plains observed below-average overnight temperatures. Alaska had its warmest October on record with a statewide average temperature of 34.5°F, 9.0°F above the long-term average. This surpassed the previous record of 34.0°F in 2013. Both Anchorage and Bethel experienced their warmest September followed by the warmest October on record. The warm temperatures also led to below-average snowfall for interior locations, with Fairbanks receiving only 0.7 inch of snow during the month. This tied with 2013 and was the second lowest October snowfall since 1926 for the city. Above-average precipitation was observed for many locations across the nation, with much-above-average precipitation in the Southwest, Central and Southern Plains, Upper Midwest, and parts of the Southeast and Northeast. Texas had its wettest October on record with 6.86 inches of precipitation, 4.33 inches above average, surpassing the previous record of 6.17 inches in 2002. Several heavy rain events impacted the state during October, causing widespread flooding. Eight additional states had much-above-average October precipitation. Below-average precipitation fell across parts of the West, Ohio Valley and Southeast. Much of Hawaii was wetter than average during October with a mid-October rain event causing landslides and washing out roads. More than 6 inches of rain fell on parts of Maui in six hours. The heavy precipitation fell on already saturated ground, making flooding worse. Honolulu and Hilo each had a top 10 wet October. According to the October 30 U.S. Drought Monitor report, released on November 1, 22.0 percent of the contiguous U.S. was in drought, down from 29.0 percent at the beginning of October. Drought conditions improved dramatically across the Southern Plains and parts of the Central Plains, with more modest improvement across the Southwest, Northwest, Northern Plains, Midwest and Northeast. Drought also improved across Hawaii and Puerto Rico. Drought continued in southeastern Alaska, with persistent below-average precipitation impacting the region. Hurricane Michael made landfall near Mexico Beach, Florida, on October 10 with sustained winds of 155 mph and a central minimum pressure of 919 mb. This was on the top end of Category 4 strength and marked the third most intense hurricane to make landfall in the contiguous U.S. based on central pressure and the fourth most intense based on wind speed. Michael was also the most intense hurricane on record to make landfall along the Florida Panhandle. The storm caused widespread devastation across the Florida Panhandle and further inland across Georgia, the Carolinas and Virginia. There were at least 45 fatalities blamed on the storm in the U.S.
Super Typhoon Yutu hit the Northern Mariana Islands, a U.S. territory in the West Pacific Ocean, causing widespread devastation on the islands of Saipan and Tinian. A majority of buildings on the two islands were either damaged or destroyed, including the Saipan International Airport. Yutu made landfall with sustained winds of 180 mph, marking the second strongest tropical cyclone on record to impact any U.S. territory and the strongest on record for the Northern Marianas. Yutu also marked the strongest tropical cyclone anywhere on the global for 2018 to date. Above-average year-to-date temperatures were observed for much of the nation with record warmth in the Southwest. Arizona and New Mexico each had their warmest January-October on record. Further north, Alaska had its third warmest January-October on record. Near- to below-average temperatures were observed in the Central to Northern Plains and Upper Midwest. Afternoon high temperatures were particularly cooler than average for the north-central U.S. Above-average January-October precipitation stretched across the Great Plains, Upper Midwest and from the Deep South to Mid-Atlantic and Northeast. Maryland, Pennsylvania and West Virginia each had their wettest year-to-date on record. Below-average precipitation fell across parts of the West. The complete U.S. climate report for October 2018 will be available on Tuesday, November 13. According to the February 6 U.S. Drought Monitor, moderate to extreme drought covers 39.6% of the contiguous U.S. According to the April 4 U.S. Drought Monitor, moderate to extreme drought covers 9.8% of the contiguous U.S.